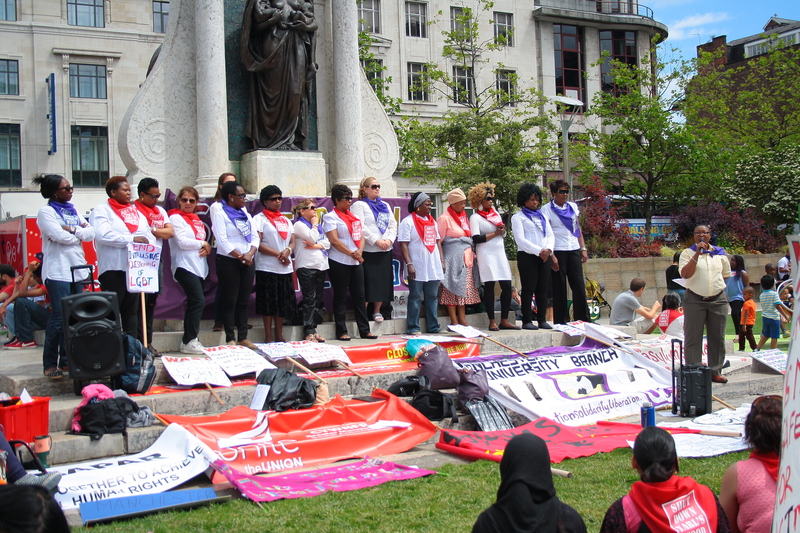 Today MiSol joined forces with WAST (Women Asylum Seekers Together) and Safety4Sisters to host a demonstration calling for the closure of Yarl’s Wood detention centre that has caused untold physical, psychological and sexual abuse to the women asylum seekers held inside. The demonstration was lively and beautifully accompanied by the WAST choir giving it that extra energy on such a sunny day. Many people came out in solidarity and many more engaged as they passed the demonstration by asking questions and taking leaflets. Well done to all those who worked hard to organise it and thank you to all those who turned out. The fight isn’t over, but after today’s show of support we can be sure we will can go forward with unity and strength. Previous Calling all Manchester students (or others moving around this summer)! Next Asylum for Aderonke: Nigerian Lesbian & LGBT Activist’s Judicial Review Hearing!! !